Chelsea overcame a Halloween fright on Frank Lampard’s return as two own goals cost Derby County in a 3-2 loss in the EFL Cup on Wednesday. The hosts were not immune to horror moments at the back, with Jack Marriott and Martyn Waghorn on target in a thrilling five-goal first half that concluded with Cesc Fabregas restoring his team’s lead. And it proved to be the winner as the upright denied David Nugent late on and left Blues legend Lampard to contemplate the unusual feeling of a Stamford Bridge defeat. 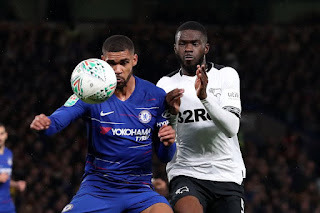 Tomori and Mason Mount were granted special dispensation to feature against their parent club, yet the Rams might have wished that was not the case when Davide Zappacosta’s cross struck the former’s standing leg and diverted in for the fifth-minute opener.